Activate this card by paying 800 LP, then target 1 Fusion Monster in your Graveyard; Special Summon it and equip it with this card. 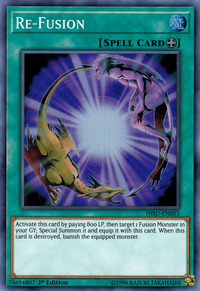 When this card is destroyed, banish the equipped monster. This is a fusion version of Fulfillment of the Contract and Premature Burial, as well as possibly Wicked Rebirth. This is one of few cards seen in the anime, but never actually played. The artwork of this card seems to be a more realistic version of the artwork of Polymerization. Applying "When this card is destroyed, remove the equipped monster from play." does not start a Chain Link. You cannot use "Re-Fusion" to Special Summon a Fusion Monster that was Summoned with "Magical Scientist", or otherwise not properly Fusion Summoned. VWXYZ-Dragon Catapult Cannon: Once properly Summoned by the method written in the text this card can be Special Summoned from the Graveyard with effects like "Call of the Haunted" or "Re-Fusion".